Burgers are one of the most popular eating-out foods today, and their popularity has led to a number of trends when it comes to high-end cuisine. In this article, we spend no more than five minutes outlining some interesting things about the modern burger industry, including a new focus on healthy and high-quality ingredients. No one really knows where they originated, although the earliest records suggest Germany in the 1750s. But no matter where they are from, burgers have become an almost iconic facet of western cuisine. And in the glorious modern age, “burger” defines everything from a greasy patty between the halves of a squashed bun to a half pound monster topped with Monterey Jack, Applewood-smoked bacon, and avocado. Whether it’s ready to go in a paper bag in thirty seconds or savored for more than an hour at a nice restaurant for date night, burgers satisfy our needs and wants in many different ways. In the United States, Schweid and Sons does an annual report on the country’s burger trends. No such studies are conducted in Ireland and the UK, but many rising fads in the burger industry are still observable—and delicious. In recent, as restaurants try to outdo each other with their cuisine and attract the widest range of patrons, a number of burger types have emerged in response to emerging cultural trends.Here are our top 5 burger trends. Forget big macs. These burgers aren’t so much sandwiches as an entire meal and then some precariously balanced between the halves of a toasted brioche bun. Often made with multiple patties—and multiple kinds of meat—they are also stuffed with onions, lettuce, cheese, tomatoes, and anything else an ambitious chef can dream up. Only the most daring (or foolish) try to eat these like the humble burgers of old; toppling these scrumptious Towers of Piza and consuming them with utensils is most often the prudent choice. Ever seen a guy do a good workout at the gym and then head to the restaurant and order a burger? This is actually not uncommon. For one thing, the proteins and fats in the burger are greatly needed by people who do regular, intense exercise. For another thing, burgers—and hearty food in general—is quite popular among the fitness crowd to restock on muscle and calories, especially if it’s labelled as natural or high quality. While they certainly do not appear to be an ideal food for keeping fit, burgers are actually not a bad fit to this bill, particularly when the modern burgers with their avocados and glazed onions get involved. Even fast food chains are getting swept up in the healthy cuisine fad. Instead of the grease-drenched burgers of old, smeared with cheap ketchup and cheese of questionable origins, today’s consumers want high quality meats with a healthy history. More and more restaurant menus sport labels such as “organic,” “no growth hormones,” “non-GMO,” and “locally grown”. Some places even have a board sporting the origin of that day’s shipment of meat. This burger trend is definitely pushing dinner in an overall healthier direction with demands for better quality meat, fresh vegetables, and naturally grown ingredients. Why bother with sides? Just put everything on the burger instead. This trend isn’t limited to things like pasta or mashed potatoes, either. 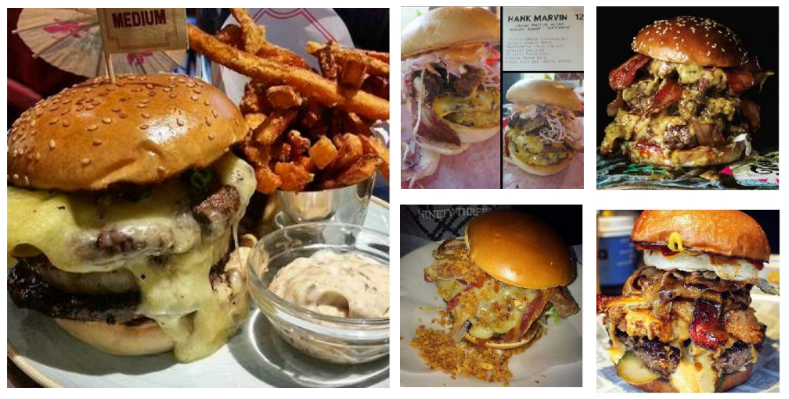 Doughnuts, puddings, pop tarts, brussels sprouts, and other unlikely foods have found their way onto various burgers sold around Ireland and the UK. They may not be for weaker souls, but their persistence on the market indicates some level of popularity. After all, who doesn’t remember fond childhood days with burgers and mac ‘n’ cheese for dinner? Who said burgers need buns, anyway? Even if burgers aren’t marketed as “bunless”—and quite a few are—most restaurants are more than willing to remove the bun from in order at a consumer’s request. There a multitude of reasons for this: medical restrictions, special diets, or even just not wanting that much food. Bun substitutes have also made an appearance, ranging from doughnuts and waffles to mushrooms and slices of tomato. Not only do these offer alternatives to people with medical conditions, such as gluten- or lactose intolerance, but they also appeal to anyone who is trying to avoid carbs. While they’ve seen some interesting changes over the past few years, burgers are perhaps even more popular than they were in the past. This is largely thanks to a number of trends that expand burgers’ availability and popularity to niches of the population that would otherwise ignore or avoid them. In addition, burgers’ new viability as both a healthy meal and a gourmet entrée to be enjoyed during a nice evening out has expanded its reach to even more people. So go find a burger that works for you today.